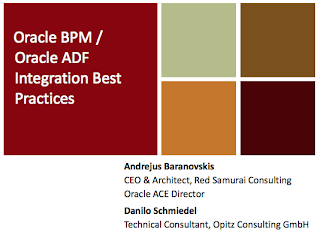 I'm posting slides from our OOW'12 session - Oracle Business Process Management/Oracle ADF Integration Best Practices. I was happy to present this session on OOW with my colleague - Danilo Schmiedel, from Opitz Consulting. We were speaking about different BPM and ADF integration best practices. Danilo covered a lot of BPM related content as well. One of the central focus points was around Generic Task Handler concept (read more about it here).